Where do you see yourself on the list? Ghosts could be real, but I believe a hundred percent in angels. Alien life forms are likely I think. Bigfoot is real if you believe "Six Million Dollar Man" but they're controlled by aliens. I can't think that we are the only life forms in our entire galaxy never mind universe. I believe there are ghosts or spirits and I believe in angels as well. Bigfoot, Sasquatch, Yeti or whatever he/she is would already have been found. I think Yeti is sunbathing in the Dominican. Well, if angels are definitely real then demons are too. When you die, your spirit lives on...ghosts as in the Holy Ghost. 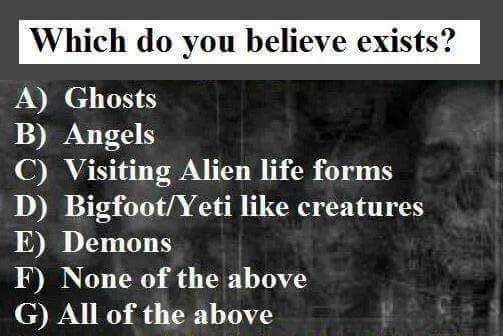 Yetis, Bigfoot and aliens as in extraterrestrial beings have still to be proven and yet so many have seen them. I'm a G.